Here is a little suggestion for Microsoft Windows Design team to improve Windows for the modern/mobile age. I have been fighting this past week to get my VHD boot device upgraded to Windows 8.1 as I have grown tired of waiting for Microsoft to fix this problem. If you’ve not heard, Microsoft choose to leave out the upgrade of an official Install Scenario of Windows called VHD Native Boot. This is an officially supported Install option for Windows since Windows 7, but without warning to the community, they are not going to upgrade you from Windows 8RTM to any later version if you’re running in Native Boot. Some of us purist have been waiting for an official explanation and answer from MS about this issue, but it is getting too long waiting for answer, so I have decided to upgrade my VHD device to Win8.1 via full attachment to HyperV server. I will discuss this later in another post. For now it is about the Windows Folder and mobile devices. Here above you can see my headache, I need to upgrade this 30GB VHD fixed drive to Win8.1, but it failed because there is not enough space on the drive to upgrade; if you consider that a file of about 3.5Gb has to be downloaded from the Store to upgrade it. So then, two options, either prune the VHD or extend it to higher volume size. Well, tried the later on a copy of the drive, increased it to 50Gb only to have the key revoked because the Machine ID computation has changed due to different volume size. So I am left with pruning the Original VHD drive. So here I am looking into my space consumption on the drive as you can see above. 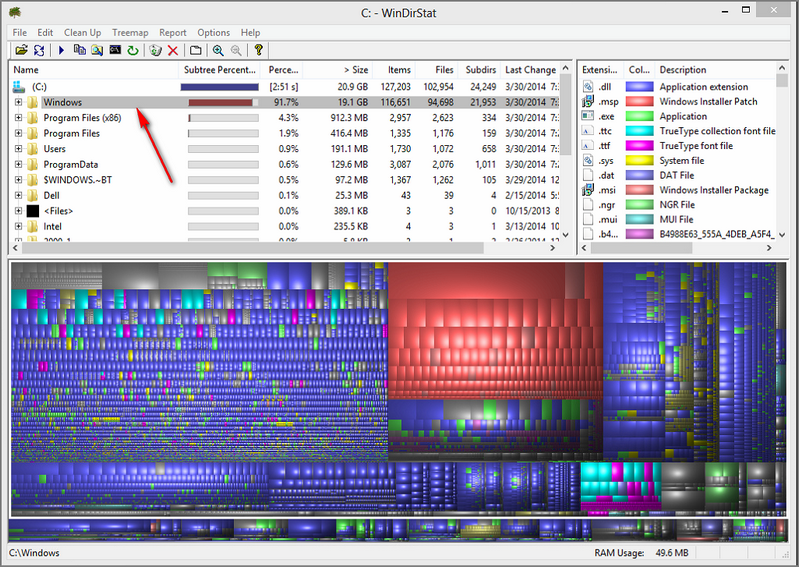 Of the 30Gb, more than 20Gb is consumed by the OS, vis-à-vis the Windows folder. That got me thinking, why so much data in the Windows folder. Mostly consisted of DLL deadwood. Some DLLs you don’t touch for years! Those in the know, know that there is a heated discussion going on about the WinSxS folder. This is a bloated folder. I know, some of the materials there are virtual, symlinks etc etc. I don’t care. All I see is that I am losing space to files I probably will never touch. Now comes the question. Why are we still carrying deadwood around in the Windows Folder in the 21st century? In this age of mobile devices, 20GB of OS usage is ridiculous if you consider tablets have mostly 32Gb space. iOS and Android tablets are whipping Windows tablets in terms of space usage. Of course I know MS is doing its best to reduce Windows footprint on mobile devices, but it is not about the space usage at OS initialization, but how fat it gets after six or 12 months. Windows is notorious for getting bloated with age, it is still the case unfortunately. That VHD above was 12Gb when I installed it with Win8RTM. After WinSxS, Installer is the big space waster. I know you need those files in there to be able to uninstall or repair installations. But people, how often do you uninstall your Windows Desktop Applications? Most files in WinSxS and Installer folders are Static DLLs and Exe files rarely used. This brings me to the solution. This is the 21st century, I am subscribed officially to my ISP for an internet bandwidth of 150Mbit connection. That is 150mbit down and 150Mbit up! That is faster than my LAN connection 5 years ago! So here I am with all these bandwidth with no limit on my data cap. Why do I then have to keep all these DLLs in Windows folder while they could easily be downloaded on the fly from the Internet from Microsoft or OEMs? Microsoft has proven via OneDrive that you can have a folder on your device that looked like a local folder but it is actually in the cloud, files are downloaded as needed and kept local. Why not extend this concept to the Windows Folder?! Keep the minimum DLLs with the Windows Install or App install, download other DLLs as needed from a repository online. If I haven’t touched a DLL in 3 or six months remove it from local to release the space it is consuming. In this age where I am downloading 5Gb install ISO from Microsoft without blinking an eye, what is to prevent MS utilizing the Internet for the mobility. With this, we can reduce WINOS footprint to absolute minimum (Min-Win anyone? ), rest is mobile as needed. Then Windows can compete on small devices like rest and remain nimble. Recent Microsoft creed is about the Cloud and devices being one. Isn’t it time to really mean that literarily by making the Internet an extension of my Windows folder? Is this an idea worth implementing, is there any objection to the idea? I’ll like to hear from everyone and Microsoft. Leave your reactions here below.